I never fail to be impressed by the quality of the wines from the Tortochot family. 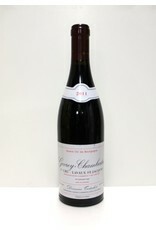 Similar 1er Cru Gevrey can sell for much more yet won't necessarily be better. I was sure not to tell him that when I tasted with him recently. I like his prices where they are now. The wines are a little bit modern which makes them very drinakble but they still retain all their Burgundian charm. This Lavaux is smoky with lots of blackberry and strawberry.